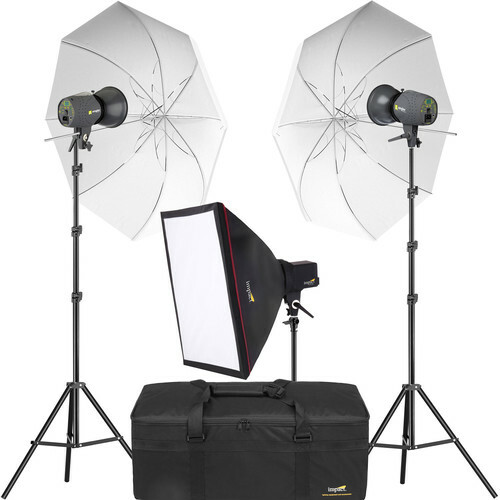 2 x White Translucent Umbrella: 43"
B&H has put together this Angler 3-Monolight Portrait Backlight Kit with Bag for photographers who require a three-point setup with versatile modifiers and lights with quality performance features for the studio or on the road. 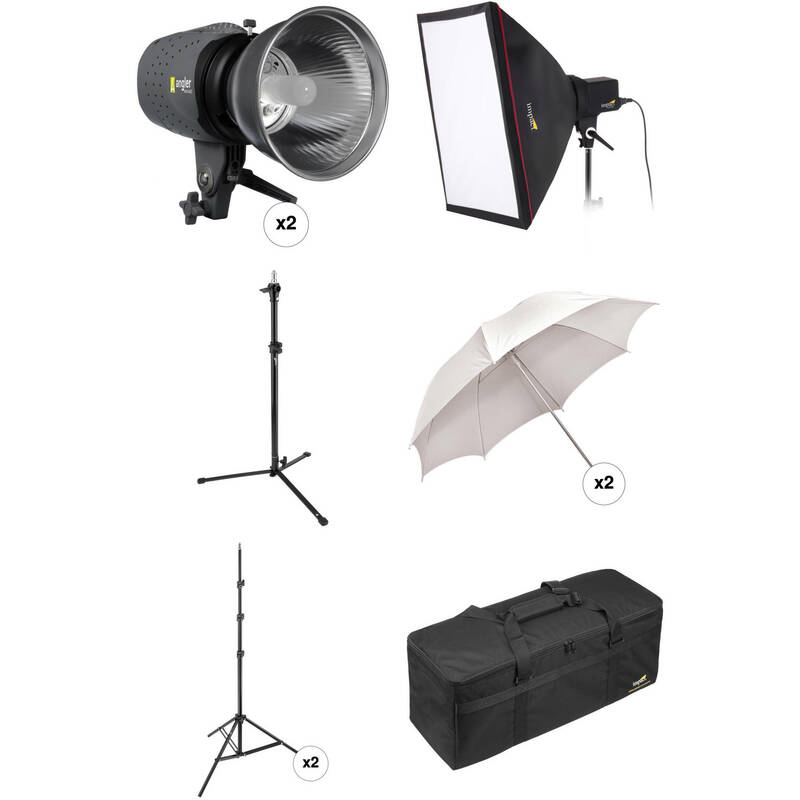 The kit includes two Angler 300Ws monolights with reflectors, an Impact EX100A flash head with a 24 x 24" softbox, a three-foot backlight stand, two 43" white translucent umbrellas, and two eight-foot air-cushioned light stands. It all fits in the provided padded kit bag. The Glamour Flash 300Ws Monolight from Angler combines affordability with dependable basic functionality. Power is adjustable from 1/16 to Full power over four stops via touchpad buttons. Settings are displayed on the large LED screen. The 100W modeling lamp can be set from full power for maximum visibility to Proportional to simulate power adjustments to enable previewing of your shot. Recycling is a fast 2 seconds and far shorter at reduced power settings. The Glamour Flash has an industry standard 5/8" receiver that mounts to a wide variety of light stands while the housing is rubber-coated to provide a grippy surface and protection from impact damage. The flash head can be triggered with the head's test button, a built-in wireless optical slave or with the included sync cord. The Glamour Flash comes with a user-replaceable flash tube, power cord, 100W modeling lamp, 7" grid reflector and a protective cap. This 3' Impact Back Light Stand consists of a base and riser. Use the lower part as a base to place a mounted light at floor or table level, as low as 5.5". Add the extension to the base to raise the height of the light from 22.8" (57.9 cm) to a maximum of 3' (90 cm). The stand is constructed of black anodized aluminum. Box Dimensions (LxWxH) 21.5 x 10.5 x 6.5"
Box Dimensions (LxWxH) 20.55 x 3.3 x 3.25"